Hey guys, I have a great idea. Lets go on a 109 mile bike ride….in the desert…in 90 degree heat. Awesome, why not? It was a beautiful day in Tucson. Completely clear, blue skies. Crisp in the morning and blazing hot by 11 am. Overall, the ride was really hard, probably much harder than I thought. Luckily I was somewhat delirious between mile 50 and 87, so I didn’t notice it much. I’ve never participated in such a huge athletic event. 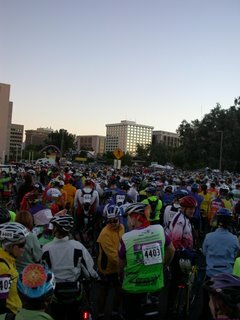 There were 8000 participants of which around 5000 started the 109 mile ride. The rest all completed shorter races, either 30, 50 or 80 miles. There was a mass start at 7 am and we were about half way back in the pack. The first 30 miles were pretty much smooth and easy. Except DD’s flat tire. Our other cycling partner noticed DD was gone. I ended up turning around and riding a mile to find him. Next was a series of rolling, uphill bumps in the road. The first part was pretty steep and I pretty much hosed my legs for about 20 minutes. So I rested a bit in the miniscule shade provided by a cactus. (see photo, next post) There is always a good for every bad, or in this case a down for every up. We raced down a series of rolling hills on Freeman Road for 2 or 3 miles, sometimes hitting 39 miles an hour! What a huge reward for my blown out muscles. The real fun was yet to come. We had to cart our bikes over a half mile of wash right near the Canyon Ranch. It was just starting to get really hot. We knew we had a really steep uphill to get out of the canyon, and as luck had it, we also had about 8 miles of uphill through the foothills of the Catalina Mountains. Somehow we did it all, I think this is where the hallucinations set in at first. Lucky SAG stop at mile 56. It was our non-riders from Team in Training. They had PB &J, pretzels and cookies. If they hadn’t been there, I would have done “ride through” at Pollo Loco or Karl’s Junior. I was just that hungry. We still had another series of climbs and many miles to go. This series would end up equalling about another 10 miles of nearly all uphill combined with just enough flats to catch a breath or two. Somehow we did it. As I said, I’d gone a little loco. Which in hindsite was a very good thing. DD, Kate and I took off like the devil was chasing us. We averaged 16 mph over the next 22 miles. (up until then our average was around 12 mph) We went flying around some really kooky looking mountains then down Silverbell Road, which was 10 final miles of “homestretch”. Right about then we had to turn on our “running” lights, because it was now completely dark. Yep, dark, as in really super dark in the desert kind of thing. We were able to follow along our 2 foot diameter pools of light. You know how you’re not supposed to outpace your headlights? We were! Finally we lurch around the last bend of Silverbell to Congress. We see a mass of flashing lights, street lights and magical fire engines. We know it’s finally the finish. Our entire team, who handily kicked our asses, was waiting at the finish to cheer us on. So was my cousin and her 2 year old son. We rode to finish and we did. We rode to survive in the desert and we did. We rode to raise at least $7000 for Team in Training and we did.